With the perverse and wrong-headed decision to sack three of his shadow ministers, and to accept the resignations of two more, for the offence of voting for Chuka Umunna’s amendment favouring Britain’s continued membership of the single market and the customs union, Jeremy Corbyn has virtually completed his project of reversing the Labour party’s official policy, endorsed unanimously by the 2016 party conference, of keeping open the option of staying in the EU. This abandonment of the party’s considered policy, and of the country’s interests, was clearly signalled by the leader’s equally perverse decision to order his parliamentary colleagues to vote with the Tories for Theresa May to trigger article 50 last March, also in blatant defiance of agreed Labour policy. By imposing a three-line whip on mostly reluctant Labour MPs, Mr Corbyn has effectively reversed the party’s formal stance at the time of the EU referendum, according to which Britain’s best interests are served by remaining a full member of the EU, substituting his own antiquated and far-fetched view of the EU as a capitalist conspiracy. By doing so he risks alienating the substantial pro-Remain majority of the under-45s who flocked to support Labour generally, and Corbyn in particular, at the June 2017 election. A majority of all MPs and peers, including a majority of Labour parliamentarians, know that leaving the EU will severely damage the living standards of ordinary working people, destroy jobs, raise the cost of living, sharply reduce our ability to trade on preferential terms with our closest partners and friends, damage the protection afforded by the EU’s clout against the power of the great multi-national corporations to exploit us, wreck Britain’s international influence and standing, limit the freedom of Brits to travel and live freely throughout our own continent, and invite the incredulous mirth of the rest of the world over our inexplicable folly. And all because of the reckless misinterpretation of a purely advisory, non-mandatory referendum which revealed only that opinion in the UK was, and probably still is, almost equally divided between those in favour of our membership of the EU and those against. 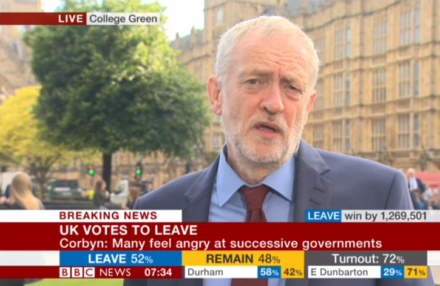 Had Corbyn campaigned with the rest of his party against leaving the EU with even half of the flair and charisma he displayed in fighting the election campaign in June, the referendum result would almost certainly have been different, and Brexit would now be just a bad dream. History will judge Corbyn to have been almost as guilty as May and David Cameron of the self-harming folly that is driving our country to disaster. Britain desperately needs a major political party or movement willing to commit itself to stopping Brexit in its tracks, while there is still time. This ought to have been Labour’s role and destiny.